Dress up your wedding favors with a little charm or embellishment that highlights your theme or matches your décor scheme. These charms add a small finishing touch to wedding favors without a lot of extra work or expense. The charms you select should fit with the style of your wedding. This means they should feature your wedding color and/or theme as well as fit with the favor itself. 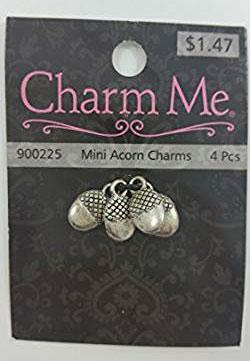 Acorn charms - A set of four acorn charms (pictured) costs around $1.50 when you shop through Amazon. They are ideal for an autumn or harvest themed wedding to top your fall wedding favors. Carriage charms - Destination Wedding Favors sells 8-packs of carriage charms perfect for a fairytale or Cinderella wedding. They cost around $6 per pack, and you must order at least three packs of the silver-plated charms. Casino favors - A Las Vegas destination wedding or Vegas-themed wedding is the perfect place to hand out favors adorned with enamel casino charms. A set of 12 costs about $13 at Favors and Flowers and features a variety of casino-related items, from dice to roulette wheels. Compass charms - A set of 12 compass charms will set you back around $8 from Favors and Flowers. They have an old-fashioned brass finish and are perfect for a wedding on the ocean, near a lake, or a destination wedding. Key charms - Vintage, Renaissance, or Victorian weddings will be complete when you add a David Tutera key charm to the favor bag or box. These brass keys come in a set of six for about $13 from The Country Porch. Mini champagne flutes - Select small silver champagne flute charms from Jo-Ann Stores. They come in a set of 12 for about $3 and feature a pair of flutes tied with ribbon. Use them for weddings where you give out wine, craft beer, bottle stoppers, or other cocktail accessories. Seaside charms - This set of small round charms features a variety of stamped nautical images perfect for shoreside nuptials. Designs include sailboats and sea shells. These metal charms are less than $7 for a dozen at Oriental Trading. If you'd rather go with traditional wedding images rather than focus on a specific theme, there are plenty of great charms to use on your favors. Blue heart charm with crystal - A heart-shaped charm looks lovely with a wedding that uses blue as one of its main colors, regardless of any overriding theme. The charms are sold separately from The Wedding Outlet for about $3.25, with a minimum purchase of six. Bride and groom charm set - A silver bride and groom set from Hobby Lobby will set you back about $3.50 for each pair, but will add a personalized touch since the couple is part of the favor. Attire is made of enamel. They are perfect for any wedding. "Made with Love" hearts - If you're giving out homemade wedding favors, a small heart that says Made with Love is the perfect finishing touch. 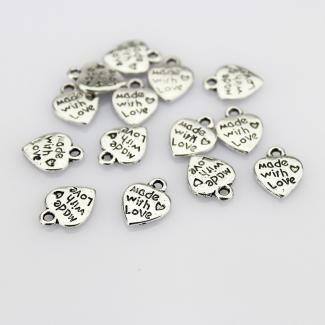 The hammered metal charms come in a package of 75 for about $6 from Factory Direct Craft. Miniature heart charms - Select a metal wire wrapped heart for your charm and pick from six colors: silver, fuchsia, purple, gold, apple green, and turquoise. You'll get four colorful charms for about $1 from Factory Direct Craft. Rhinestone dangle charms - These rhinestone charms add a little pop of color and some bling to your favors. Use them to make any favor look a little more luxurious. They run about $6 for a set of 24 at Oriental Trading. Tassel charms - A set of six different colored tassel charms costs about $3 at Hobby Lobby. These are fun to use at a rainbow wedding or spring/summer wedding where color is a key component of the celebration. No matter what charm you select, you're going to need to incorporate them into your favors. Work into the favor design - If you're crafty, the charms can be incorporated into the favors themselves. 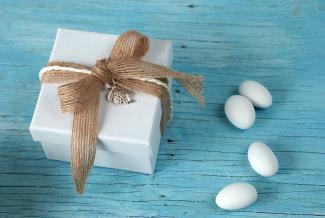 For example, add a charm into a homemade votive candle holder or glue one to the wrapper of a DIY wedding cupcake favor. Tie to favor bag - Tie the charms around the top of a wedding favor bag. Use raffia or ribbon to close the bag, tying the charm on as you complete the bow. Incorporate into tag - Add the charm to the favor tag before attaching jt to the favor bag or box. Dress up the favor display - If you're placing groups of favors in a wire or wicker basket, have the charms hang from the handle with colorful ribbons. If you're using a stand, hang the charms around the bottom of the stand. You're not limited to using charms on just the favors. If you select your favor charms early, you can use them throughout the wedding. Punch a hole in the top of your invitations and attach the charm before you send them. Add them to the corner of your wedding programs. Tie them around napkins at the reception. 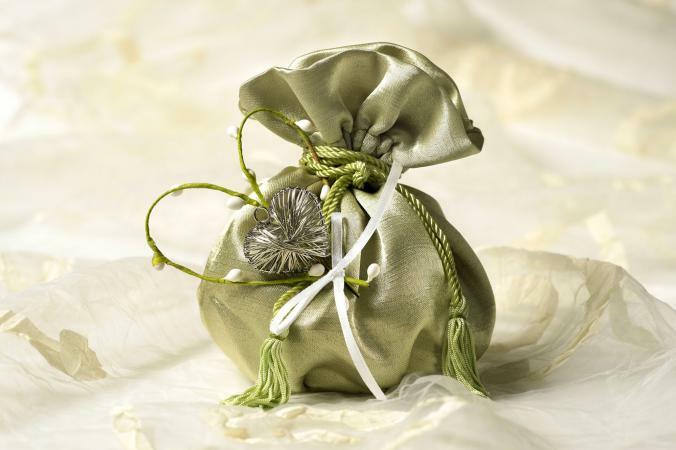 Adding charms to your wedding favors is a small detail that can tie the wedding together. Guests will be charmed by the mini embellishments and may even hang onto them after the night is over.